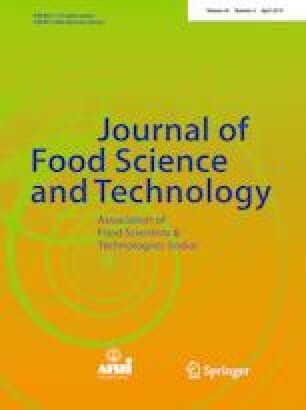 Effects of the pretreatments namely heating, microwave (MW), and ultrasound (US), followed by the enzymatic hydrolysis using different proteases (flavourzyme, neutrase, and protamex) on the protein recovery, umami taste compound content, and antioxidant activities of the Labeo rohita head (LRH) protein hydrolysate was investigated. US and MW pretreatments increased the protein recovery, MSG-like amino acid and flavour 5′-nucleotide contents, equivalent umami concentration (EUC) and antioxidant activities of LRH protein hydrolysates significantly (p < 0.05). The type of enzyme influenced the protein recovery and EUC significantly but did not influence the flavour 5′-nucleotide content of LRH protein hydrolysate (p > 0.05). The highest recovery yield of LRH protein hydrolysate (69.75%) was obtained with the MW pretreatment followed by the protamex hydrolysis, while the highest EUC (41.82 g monosodium glutamate (MSG)/kg) was yielded with the combination of the US pretreatment and the flavourzyme hydrolysis. These results indicate that US and MW pretreatments can help to enhance the recovery yield, umami taste compound content and antioxidant activities of the LRH protein hydrolysate. The online version of this article ( https://doi.org/10.1007/s13197-019-03663-3) contains supplementary material, which is available to authorized users. This work was financially supported by The World Academy of Sciences (TWAS), Italy and the Department of Biotechnology (DBT), Science and engineering research board (Grant No. ECR/2015/000215) India. We also thank the Director of CSIR-CFTRI, Mysuru, for allowing to access the facilities and permission to publish this work.